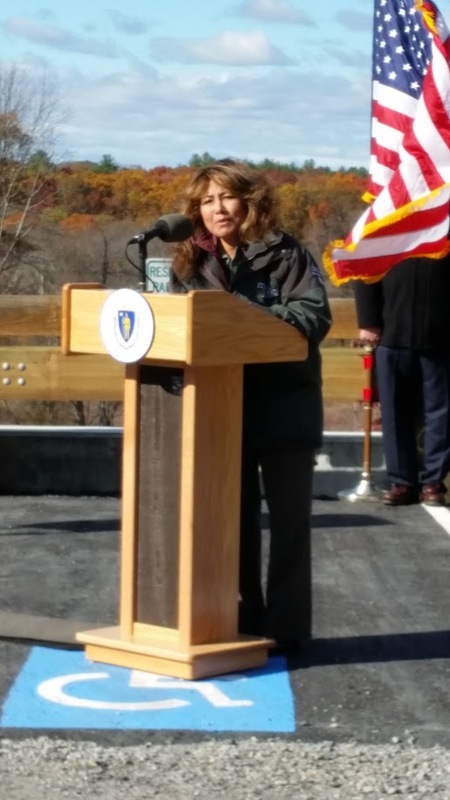 This morning was the official ribbon cutting and opening of the new Charles River overlook dubbed the Gateway at Medfield. 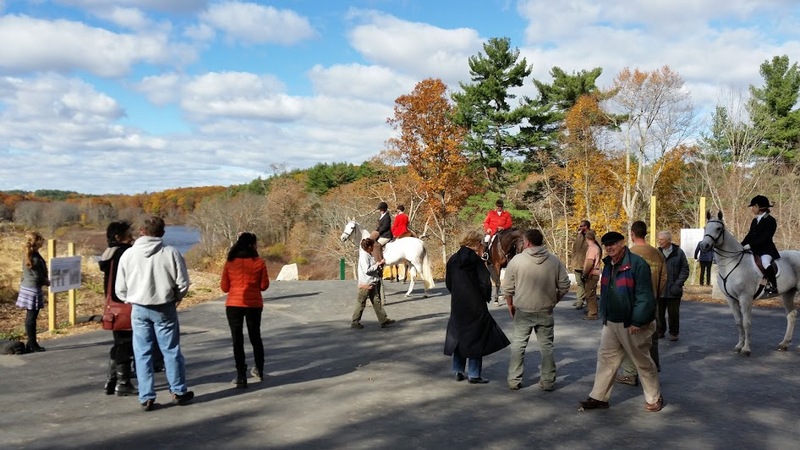 Over one hundred people gathered in the strong fall winds at Medfield’s newest jewel, high above the Charles – some walked, some rode bikes, and some came on horses. Richared DeSorgher officiated with a loud speaker’s voice honed by years in the classroom. Bill Massaro, John Thompson, and John Harney were signaled out repeatedly for their efforts that turned the ship of the Massachusetts state away from its less expensive, simplistic, but legally sufficient cap and cover formulaic clean up, to the result that has created the state’s newest park, with dramatic views down to the Charles River below and the largest recreated wetlands in the history of the river. Yesterday morning Mike Sullivan, Richard DeSorgher and I met with Jay Ash, the Massachusetts Secretary of Housing and Economic Development to learn what the state can do to assist Medfield with our economic development and housing issues (see photo above). 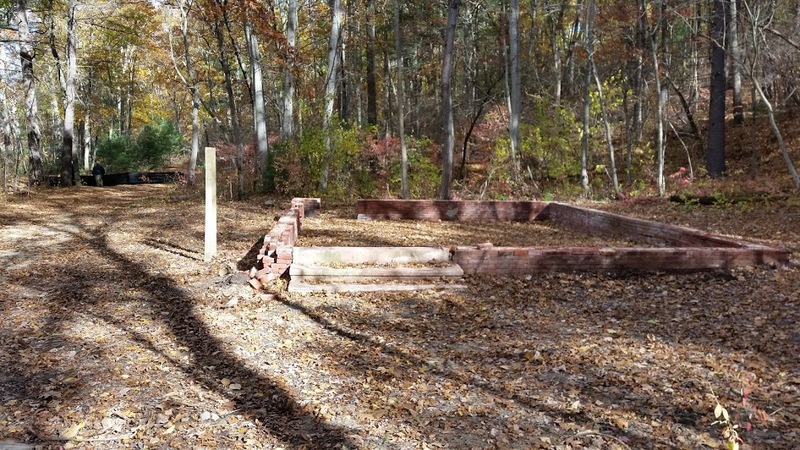 After that four town meeting (Wrentham, Norfolk, Walpole, and Medfield) at the Wrentham Town Hall, Medfield showed the Secretary the former Medfield State Hospital site (see photo below). to just have the man who administers all state economic development and housing monies know about the MSH site and its expected development so he can help get the word out and be knowledgeable if and when grant applications are made. Walpole is negotiating with an international company to site a facility that will provide 600 jobs – company is looking for 90% reduction in its taxes. 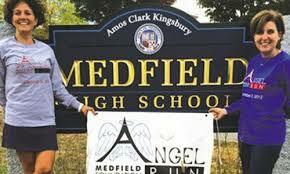 Medfield Foundation Angel Run is celebrating its 10th Anniversary! The race will take place on Sunday, December 6th at 2PM. If you register by October 31st you will save $5 (early registration is $25 and race day registration is $30) AND you will receive the always popular Angel Run T-Shirt. This year 10th anniversary keepsakes can also be purchased through online registration (they will be available at Park St. Books after on-line registration closes 10/31). You can register at http://MedfieldFoundation.org. We are currently looking for volunteers to help us make this year another big success. We would appreciate it if you would review the volunteer opportunities available on the link below and sign up to help us make it happen. Please note my fellow committee chairs will also be sending similar emails out. It is possible you will receive more than one email requesting your assistance. Please excuse the inconvenience. It would also be great if you could share this email with your network to help recruit both participants and volunteers. The Angel Run is all about helping Medfield residents in need and the Medfield Foundation motto is “Building Community” and we can’t do that without you. It’s the final week of MGM in October! because you have been recycling all month? Refoam-it will be collecting Styrofoam to be recycled. Foam items DO NOT have to display the recycling symbol 6 in the triangle with the PS underneath it, but do need to be cleaned and rinsed. Refoamit will accept packing blocks, produce and meat trays, take out containers (please rinse), hot cups such as Dunkin’ Donuts, Honey Dew and Cumberland Farms (without paper or cardboard infused), foam egg cartons, trays, white insulation sheets, #4 PE Polyethylene foam, bubble wrap and packing peanuts (bagged separately from your foam). 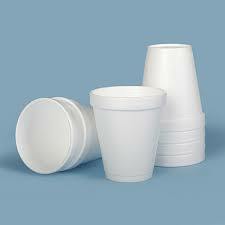 THEY WILL NOT ACCEPT: plastic utensils, foam cups infused with cardboard or paper such as McDonald’s, Newman and Burger King (ice tea cup), biodegradable meat trays for example GenPak without the recycling symbol, cardboard egg cartons, soft foam pads, food containers with plastic film attached (some ground turkey comes in these containers), blue or pink insulation sheets. (Refoamit will also be doing a collection, which is open to the public, at the Christ Lutheran Church of Natick, 113 Union St., Sat. Nov 7th 9-12, if you can’t make it to the transfer station this Sat). will be January 2, 2016 at the Transfer Station! This is the last Saturday for the Swap. Last day for drop offs is Friday, October 30th. It closes for the season on Saturday, October 31st at noon and volunteers will pack up from 12-3. If you wish to help pack up, let us know by calling 359-7251. BOXES NEEDED! Thanks! Thanks to all of the volunteers who spend many, many hours at the Swap! It is a great example of the purpose of Medfield Green Month – Donation, Reuse and Recycling and it is open May-October during Transfer Station hours. the place to be in October! 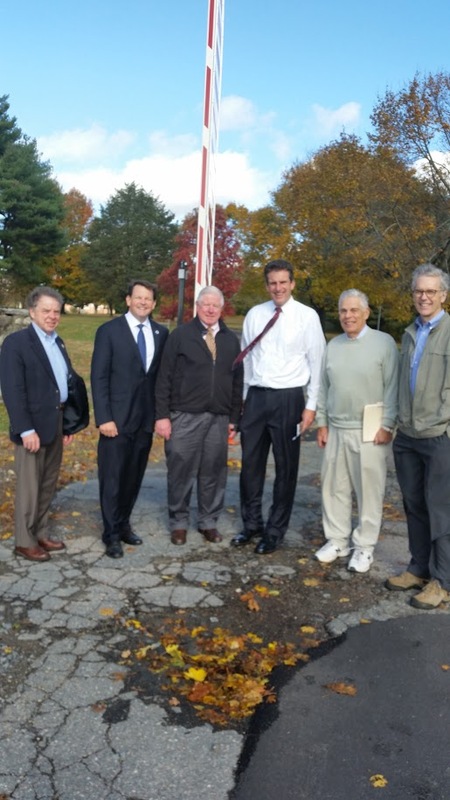 Next Medfield Green Month will be in May, 2016! I am pleased to announce that site work has started this morning. Local contractor Angelo Santucci Landscaping has begun clearing the site of vegetation. Tree removal will begin next week along with grading and seeding. If all goes well and the weather cooperates, they expect to be done by the end of next week. As of now the structural post installation will begin November 23, with panel installation to begin early-mid December. 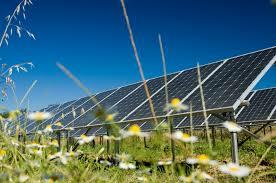 We are still on schedule for system start-up in mid-January. I’ll keep you all updated on the progress! There is not much time left to register for the MFi Angel Run. 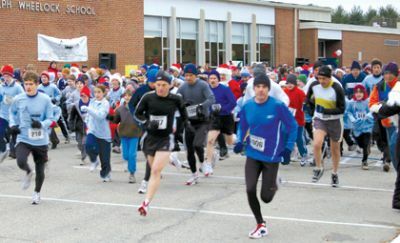 This year’s race on Sunday, December 6th will be the 10th running of the much loved family run/walk through the winding 5k route around South, Elm and Philip streets and surrounding neighborhoods. Registration is exclusively online at the Medfield Foundation’s website, medfieldfoundation.org. Register by the October 31st midnight deadline for early bird pricing and the ever-popular commemorative t-shirt. New this year is an opportunity to purchase a 10th anniversary keepsake when you register. “We are pleased to introduce bib chip timing for the race in 2015. The timing chips which are embedded into the runners’ bibs will give participants highly accurate finish times and alleviate some of the finish line congestion, ” said Rose Colleran, event co-chair. As always the MFi Angel Run is a family friendly community event and participants of all paces are welcome including strollers and dog walkers. Local businesses have been quick to sign on with sponsorship and in kind donations. “It really is an opportunity to ‘Give Where You Live’ here in Medfield,” said Evan Weisenfeld, Medfield Foundation president echoing the organization’s mission statement of Building A Stronger Medfield. 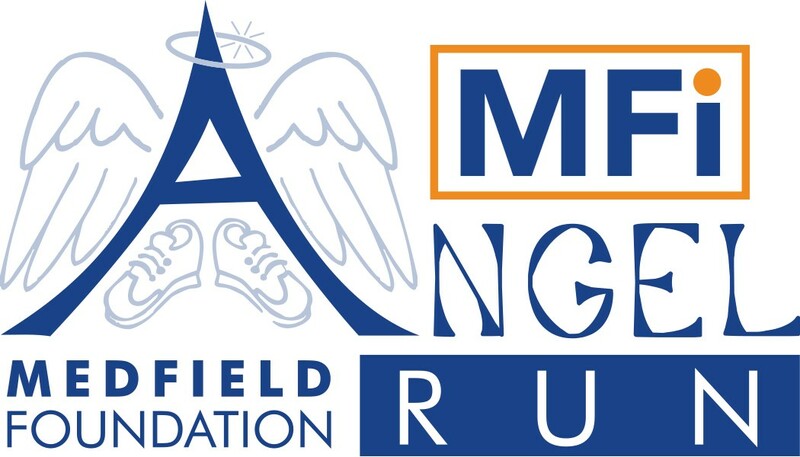 All proceeds from the MFi Angel Run are used to help Medfield residents in need. After October 31st registration for the Sunday, December 6th 2pm run/walk will only be available on race day with no option for a t-shirt purchase. Visit the Medfield Foundation website at medfieldfoundation.org to be part of the tradition.